Oh boy it was cold the week of my fifth birthday in late January and I could see thousands of new long skinny glass like icicles hanging from the roof of our home on Limekiln Lake. Propping my elbows on the windowsill in my bedroom I tried to press my cheek to the glass to really count all the slender icicles. The glass was so cold that my cheek burned and I knew I had to go outside and free some of these from their perch. I dragged all my winter cloths down the hallway and made a sort of pile on the entryway rug. My mother asked what I was up to and I said I was going out to pick icicles. It took me a while to get all my cloths on and I needed some help with my snow suit zipper which had somehow eaten up some of the fabric and gotten stuck. With all my warm cloths on it was hard enough to even reach around and zip and when frustration almost turned to tears my mother stepped in and gave everything a good yank, freeing the zipper. She reached out and pulled my hat down covering my ears and asked that I be careful. Well what sort of trouble could I get into? I thought to myself. Outside the air was still and so cold it tickled my throat. Stepping down the porch steps I waded through the deep snow around the back of the house. Here in a giant heap running the full length of the house was a pile of snow that my father had shoveled from the roof. It took me several tries to climb up the ridge of the snow pile but when on top I carefully heal toed my way along. Directly above me was the perfect neat line of icicles. When I reached up I could still not touch them even as high as I was on the snow pile. Then without warning my feet slipped and down I rushed. When I came to a halt I was pinned between the snow pile and the house. One foot seemed like it would not even try to free itself as the toe of my boot was pinned under part of the wavy board siding. When I squirmed a bit and pulled up came my foot with a wool sock on but no boot. It took about what I deemed half a day to find the boot get the snow out brush off my socks and get the boot back on all while still pinned up against the house. Climbing up out of my wedged situation I could still feel some hot like cold spots in my one boot. Back on top of the pile I decided that most of these icicles were going to have to stay but I was determined to free at least two or three. With every bit of my energy I made a jump in the air and swatted two with my mitten and one bonked me on the head pretty hard. I retrieved one that had stuck like a spear in the snow upright and made my way back inside the house. Being an Adirondack Icicle farmer was tough growing up. 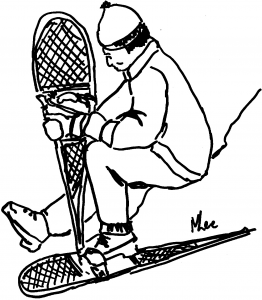 This entry was posted in Columnists and tagged Columnists, Growing up Adirondack, Mitch Lee on January 27, 2011 by admin. How many of you remember that song from Sesame Street? I used to know it word for word…. But seriously, do you want to know a super simple way to help your children do better in school? One word. Breakfast!!! There are some studies that have shown that when children have a healthy breakfast (you all know how I feel about Pop-Tart’s at this point!!!) they they do do better in school. I know that there are many adults that skip breakfast because they “just don’t have time”. What kind of example is that setting? Actively growing children need food at regular intervals to fuel their bodies and brains. Skipping breakfast gives as much as a 10- to 12-hour time frame with no food, and the potential for compromised school performance and irritability. Think about it, how cranky do you get when you haven’t eaten?!?!? Feel free, ask the boys how cranky I get when I’m hungry!!!! • Eating breakfast increases the chances of an overall healthier diet. • Kids who start the day with a healthy meal are more likely to play sports and be more physically active. • Eating breakfast improves a child’s ability to concentrate and perform in school. But mornings are so chaotic with all of us trying to get ready and get out of the house. What are some good choices? Avoid giving children sweet foods for breakfast, like doughnuts or cereals high in sugar, because after the sugar high (OK – I don’t necessarily buy into the “sugar high” theory, but eating a mixed meal of carbohydrate, fat and protein, not to mention whole grains, keeps blood sugars on a more even keel, avoiding highs and lows associated with straight processed carbohydrates) wears off, they are likely to get tired. Healthy options include whole grain, low-sugar cereal with low-fat milk and fresh fruit, or a yogurt berry parfait with granola. Or, you might offer your child a whole-grain English muffin with peanut butter or jelly and a glass of low-fat milk. Some other healthy options may include: Scrambled eggs, toast with a little bit of butter, turkey bacon or sausage, and a side of fresh fruit; Whole-grain bagel and cream cheese with a side of strawberries; Low-fat cheese toast with a side of cantaloupe and blueberries. Get creative, offer a breakfast burrito with scrambled egg and grated low-fat cheese and fresh fruit. If you’re in a time crunch, think “outside of the box”. Items such as sandwiches – peanut butter and jelly or ham and cheese leftover from dinner. Dry cereal in a sandwich baggie and a 100 percent real-juice juice box. Think back to our college days….I can’t tell you how many times I had cold pizza for breakfast. Hey, it’s got protein, carbohydrate and fat (aka a mixed meal) and if it has veggies on it even better. My personal opinion is that that is way better than some sugary, sticky bun kind of thing. I know with the crazy schedules that everyone has it tough, but planning breakfast the night before can also save you time. Healthy meals for kids don’t have to be hard or time-consuming — or even homemade. There are plenty of prepared healthy breakfast foods that can go in the microwave. Check the freezer section at your local grocery store for pre-made meals like whole-wheat bagels and cream cheese, pancakes, waffles, and frozen turkey sausage. When I was at the American Dietetic Association conference in Boston I had a chance to sample the Jimmy D’s French Toast Griddler’s. They were pretty yummy. Please, PLEASE…..avoid things like Pop-Tart’s and Toaster Strudels….you may as well give your kids a candy bar and soda for breakfast. I’d even prefer to see your kid grab a piece of fruit and Nutrigrain bar to eat in the car — it’s still healthy, even though it’s on the go! So parent’s, make sure that you and your children have a healthy meal to start the day. That way everyone can be productive whether it’s school work or work work. Have a great weekend! This entry was posted in Columnists and tagged Columnists, Dietician, Kelly Hamlin, Nourished Living on January 27, 2011 by admin. Everyone is talking about the weather no matter where they live, freezing cold in Florida, Floods in Brazil, Australia, NW-US, Mexico, California, cold in the Midwest and east, snow storms hitting the east coast for the fifth time this season and in the south for the third time this season ice and snow. It was a tad nippy here this morning 1/24 as the thermometer sat at –34, the coldest it’s been here in a long time. Tears froze on my face as I filled the bird feeders this morning. I didn’t try the hot water trick but I’m sure some did. Brother Bob said they had lake effect snow off Lake Champlain all day yesterday as a north wind blew over the open waters of the lake. Lake Erie has frozen over so Buffalo will be spared the rest of the winter from Lake effect, but Ontario is still open and it will keep churning it out. This should make the ice rinks for the lake ice hockey games this weekend on Fourth Lake about as good as they could be. I sure wouldn’t have wanted to be standing around watching there on Sunday, as the wind at around zero would have cut you in half. Hoping for better weather for this weekends games. Also this weekend is the Mike Norris Memorial Ice Fishing contest on Raquette Lake on Saturday the 29th. Cold doesn’t normally bother ice fishermen. This weekend I saw fishermen out on both Fourth and Seventh Lakes, burr! I was out taking photos of the Cathedral Pines at the head of Seventh Lake and it didn’t take very long for the cold to eat up one of my camera batteries. It was neat to shoot them from the bottom up the trunk and see what they looked like. Mirnie Kashiwa wanted a photo of these and she is also looking for a nice photo of balance rock up on Bald Mountain if you might have one, give her a call. My flock of Turkeys took to roosting in the trees right behind the house for the last couple of days. I thought it was that they would be close to the food supply come morning. Instead they flew across the pond and then had to walk back for their corn, not a very smart bird for sure. They see me put out the corn, then fly down and walk back a couple hours later. Yesterday they sat in the trees in the sun until eleven then sat on the other side of the pond in the sun, soaking up some of it’s warmth until afternoon before coming in. They seem to be doing the same this morning or maybe they are frozen to the branch they are sitting on. Gail from Trenton called me yesterday about a flock of Robins and Cedar Waxwings she had feeding in her Crab Apple tree in her front yard. She also had another bird feeding there, which she couldn’t identify. She was going to send me a picture but I haven’t gotten it yet. With all the snow along the east coast you just never know what you might see at you feeder or on berry trees in your yard. Robins have been hanging around all winter in the Utica and Syracuse area for a few years now. They find open spring swamps where they find some food and then come to area yards where they find the Crab Apples, Mountain Ash or Sumac berries to feed on. Speaking of birds as I do all the time, the Great Backyard Bird Count is coming up February 18-21. You can count birds at your feeder or in your yard or you can go for a hike in the woods and record the birds that you see and hear along the way. You can go on line to the GBBC website and get all the information. This is like the Christmas Count only held a different time of the year. This is also done nation wide and in Canada and Mexico. It shows trends of where the birds are spending the winter and if there is any wild food out there for them to eat. Around here you won’t find many birds away from feeders except for a few Woodpeckers and Chickadees, as there is little wild food available. It’s still nice to take a tramp in the woods on either snowshoes or skies as you just never know what you may find, maybe Moose tracks as they are around. Common Redpolls in winter but that’s another story. See ya. This entry was posted in Columnists and tagged Columnists, Daybreak to Twilight, Gary Lee on January 27, 2011 by admin. R201.2 Interchangeability. Words used in the present tense include the future; words in the masculine gender include the feminine and neuter; the singular number includes the plural and the plural, the singular. FENESTRATION. Skylights, roof windows, vertical windows (whether fixed or moveable); opaque doors; glazed doors; glass block; and combination opaque/glazed doors. FIREBLOCKING. Building materials installed to resist the free passage of flame to other areas of the building through concealed spaces. HABITABLE SPACE. A space in a building for living, sleeping, eating or cooking, or used as a home occupation. Bathrooms, toilet rooms, closets, halls, storage or utility spaces and similar areas are not considered habitable spaces. REGISTERED DESIGN PROFESSIONAL. An individual who is a registered architect (RA) in accordance with Article 147 of the New York State Education Law or a licensed professional engineer (PE) in accordance with Article 145 of the New York State Education Law. RENEWABLE ENERGY SOURCES. Sources of energy (excluding minerals) derived from incoming solar radiation, including natural daylighting and photosynthetic processes; from phenomena resulting thereform, including wood, wind, waves and tides, lake or pond thermal differences; and from the internal heat of the earth, including nocturnal thermal exchanges. STORY ABOVE GRADE. Any story having its finished floor surface entirely above grade, except that a basement shall be considered as a story above grade where the finished surface of the floor above the basement is: 1. More than 6 feet (1829 mm) above grade plane. 2. More than 6 feet (1829 mm) above the finished ground level for more than 50 percent of the total building perimeter. 3. More than 12 feet (3658 mm) above the finished ground level at any point. TOWNHOUSE. A single-family dwelling unit constructed in a group of three or more attached units in which each unit extends from foundation to roof and with open space on at least two sides. Always remember that definitions are written to clarify something, however, definitions for one law, rule or regulation may not be identical for a different law, rule or regulation…Always ask questions if you need to. This entry was posted in Columnists and tagged Andrew Getty, code, Columnists, Talkin' Code on January 27, 2011 by admin. Dave Berkstresser will instruct an EMT Basic class at the Old Forge Firehall beginning Thursday, January 5. This entry was posted in admin and tagged Berkstresser, EMTs on January 22, 2011 by admin. The snow had piled up pretty good around our Lime-kiln Lake home in that week prior to Christmas 1974. Heavy snowfalls were typical back then, and at the age of eight I couldn’t wait to get out and explore the woods behind our house. Prior to setting out for a hike I followed my usual routine. I ate a steaming bowl of cinnamon oatmeal and some peanut butter toast to warm my insides. This entry was posted in admin and tagged Columnists, Growing up Adirondack, Mitch Lee on January 22, 2011 by admin. Q: Are there changes to the code every year? Q: What do you mean, not normally? A: New York State Uniform Code is on a three year revision cycle, meaning every three years the Uniform Code is revised and reprinted. Q: Why don’t they do it as needed? A: The ‘old’ Uniform Code [pre-2002] was kind of like that. Through the year, new pages were sent out to the world to replace existing pages in the code book. If you got the changes, and actually took the old ones out and put the new ones in, you had the new revised text. After nearly twenty years of this, it was hard to find, or verify, that all code books were complete. Q: So that system changed in 2002? A: Yes, along with the adoption of the International Building Codes. The International Code Council (ICC), which administers the printing and adoption process – not enforcement- has a three year rotating cycle of revision. During the three years, through a complex system of hearings, a multitude of amendments are entertained. Once this process is complete, each state, including New York, can decide if they will accept the proposed changes for their state. Q: Is this International Code the same in every state? A: Not exactly, but very close. A: Probably for two basic reasons. First, can you imagine all of the states trying to agree on code language???? And second, many states clearly have different needs, example; snow load requirements from Florida to New York. So far, the ICC seems to have a great way of keeping the process in motion without having it get all bogged down in the politics. Q: Did New York State have a lot of changes for this last round of revisions? The Energy Code no longer requires higher R-values for electric heat. The Energy Code also no longer offers any exemptions for wood heat, the structure must comply even if heated by only wood, wind or solar [or other renewable sources of heat]. The ‘50%’ rule of alterations no longer applies. In most cases, alterations and repairs must comply. Additional inspection requirements for new ansul fire suppression systems and vent hoods in commercial establishments. Amanda Law [carbon-monoxide detection and warning] included in code. Driveway requirements on single family dwellings over 300 feet long….never in code before. Entire Basement wall to be insulated to 10 feet below grade [if basement is that deep]. Old code was to 4 feet below grade. Spray foam between floor joists at exterior of basement wall only, may remain exposed. New homes may require blower door test [as part of Energy Code]. All rooms shall have arc-fault outlets. Q: Who thinks all this stuff up? A: During the three year cycle, suggestions are sent into the NYS Dept. of State, Codes division, or directly to the ICC. These suggestions can come from Code Officials, Fire Departments, contractors, Architects and Engineers or even citizens. All suggestions are discussed at various committee meetings. Ultimately, the ones that make it through the review process and into the proposed changes had to be very popular and were deemed appropriate. Probably 98% of what is proposed never makes it. Call your Code Office with specific questions. This entry was posted in Columnists and tagged Andrew Getty, code, Columnists, Talkin' Code on January 20, 2011 by admin.